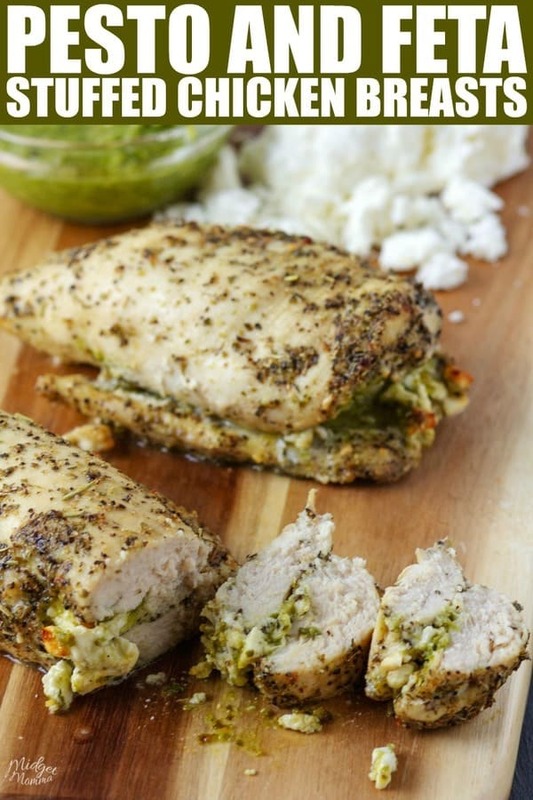 You are going to LOVE this Feta and Pesto Stuffed Chicken Breasts recipe! If you are looking for an amazing stuffed chicken breast recipe that is perfect for dinner this is it! 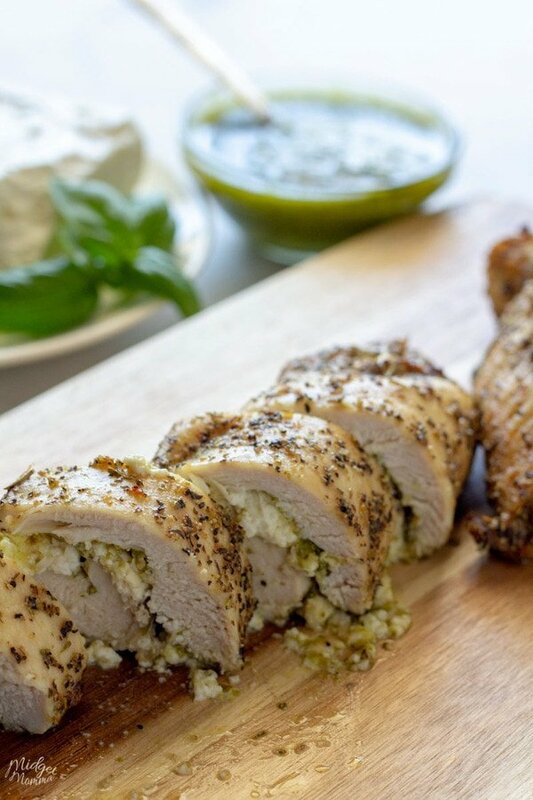 This Feta and Pesto Stuffed chicken is such a juicy and flavorful recipe that will quickly become a staple in your family meal planning! 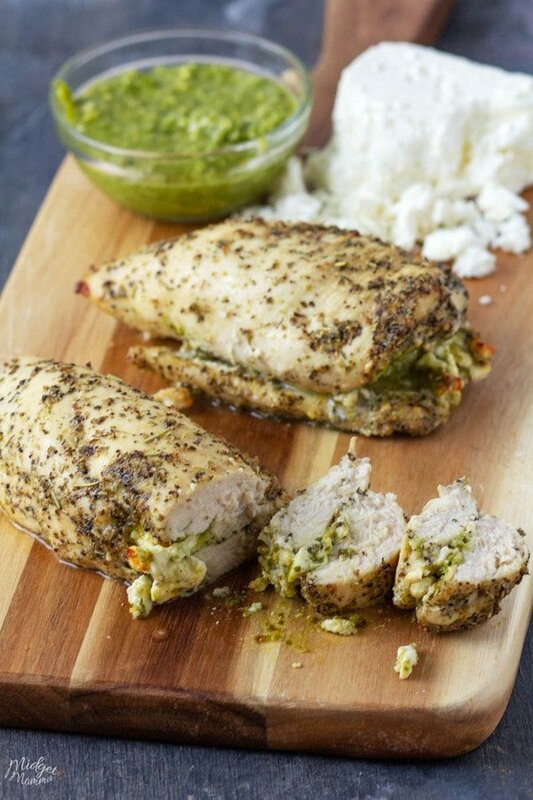 I love making stuffed chicken breasts recipes for dinner, like this Feta and Pesto Stuffed Chicken Breasts recipe. They are easy to make, put in the oven and then get other things done that I need to while the Feta and Pesto stuffed chicken breasts are baking. When it comes to feta, this tastes amazing with both Greek feta and Bulgarian feta. I am going to recommend if you can get your hands on some Bulgarian Feta cheese that you try it! They do have a bit of a different flavor, but ever since this summer when my cousin gave me some Bulgarian Feta cheese I have been using it in EVERYTHING! Anything that I would normally use Greek Feta cheese for I have been switching out for Bulgarian Feta cheese and LOVING all of it! 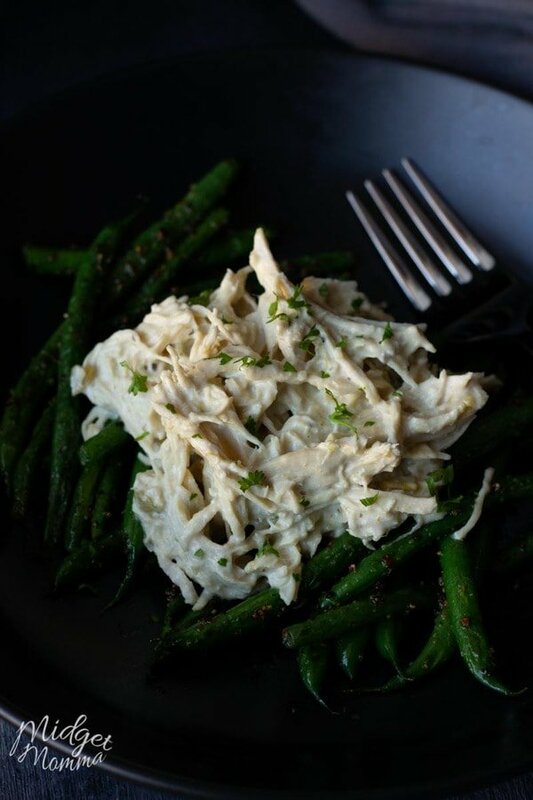 When you are making this and pesto stuffed chicken if you have a few extra minutes, make some homemade pesto. It is SUPER easy to make, but fresh pesto is amazing. The jarred stuff will work, but like it is with just about anything, homemade is the way to go when you are wanting the best flavors possible. Whenever we have a chicken dish for dinner I always have a few different veggie side dishes and a salad. Depending on how much time I have that day depends on what I make for sides. I always make sure that I have sides that everyone in my house can enjoy, no matter which way of eating those who will be eating dinner that night can enjoy. 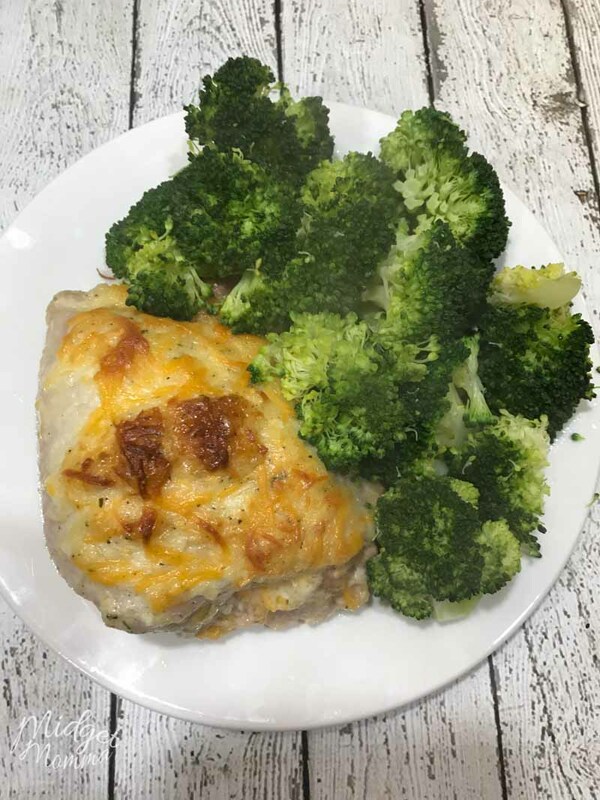 If you are eating a low carb or keto diet, this stuffed chicken breast has just 2g carbs per serving and HUGE amounts of flavors! 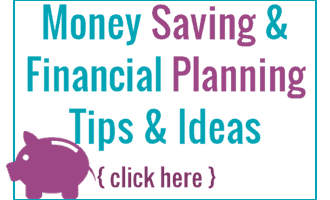 Be sure that you are choosing other items for your plate that stick with your low carb and keto diet. 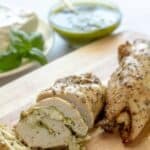 This Feta and Pesto Stuffed chicken is such a juicy and flavorful recipe that will quickly become a staple in your family meal planning! Preheat oven to 375° in line a sheet pan with aluminum foil. In a gallon Ziploc bag combine olive oil, garlic, Italian seasoning, salt, and pepper mush them together until well combined. Cut the chicken breast in half for leaving a small portion of it still connected to create a butterfly cut. Place the chicken into a Ziploc bag and shake the chicken until it’s completely coded in the seasoning. 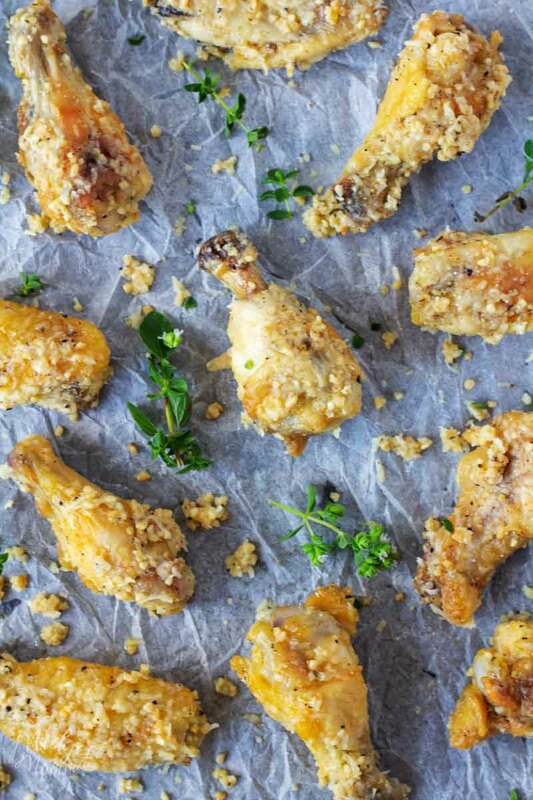 Place the chicken onto the sheet pan so they are open. 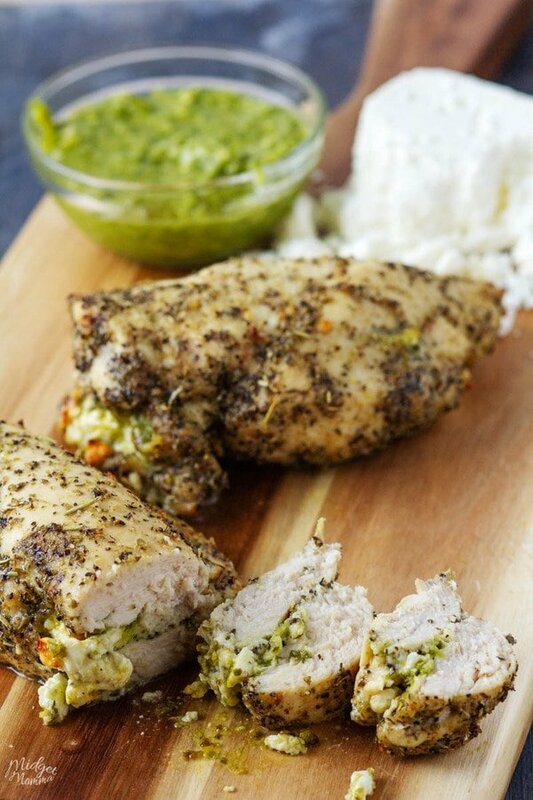 Spread 1 tablespoon of pesto onto each chicken breast and spread on half. Sprinkle about 1 to 1 1/2 tablespoons of feta cheese on top of the pesto. Roll the chicken up rolling from the pastor side into the clean side so you’ll end up with the pesto in the middle of the chicken roll. Place the chicken seam side down. 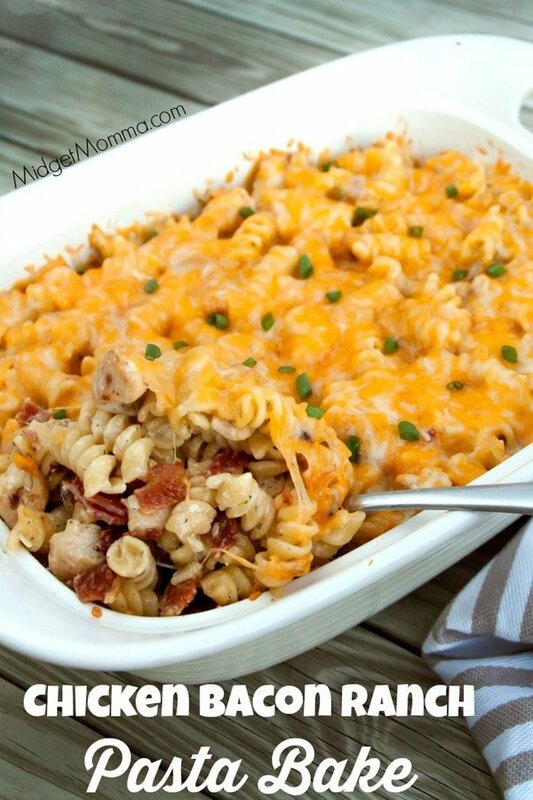 More Tasty Chicken Recipes to Enjoy! 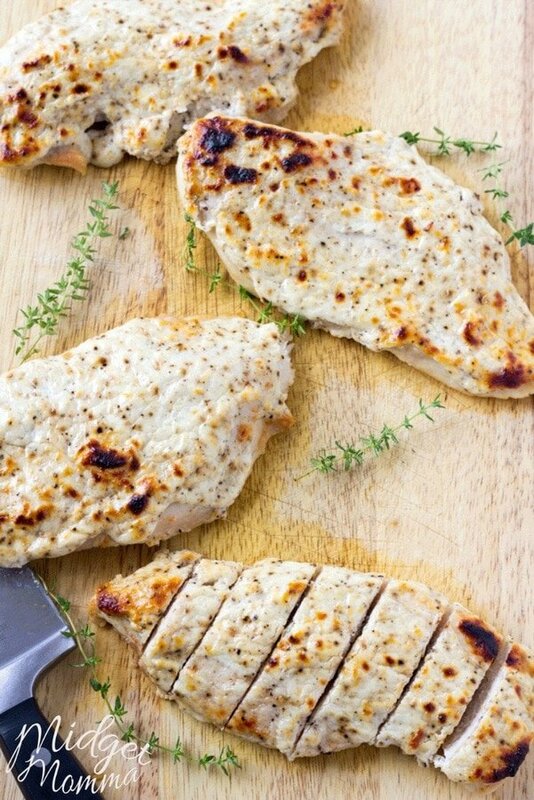 If you are looking for more recipes, be sure to check out these tasty baked chicken breast recipes!